Habit: grows from woody roots and short rhizomes with a few upright, stout, hollow stems that can reach heights of 4 ft (1.2m). The large, shiny, basal leaves are lobed 5-9 times and have large teeth on the margins. The upper stem has fewer leaves that are more deeply lobed and toothed than the lower leaves. Inflorescence is a long spike comprised of many loosely spaced, vivid purplish blue flowers with white upper petals in center. Upper stems and flower stalks are commonly covered with minute, yellowish hairs. Blooms from May-July. 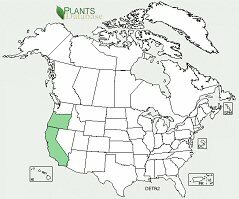 Ecology: found in moist shady woodlands, and near streams, in Western Oregon and California at low elevations 100-3600 ft (30-1100m). Growing Conditions: full to partial shade or dappled light and moist soil. Attracts butterflies and hummingbirds. 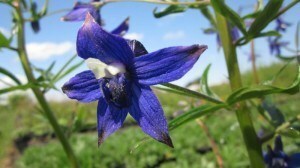 Larkspurs are poisonous and kill many livestock through ingestion.